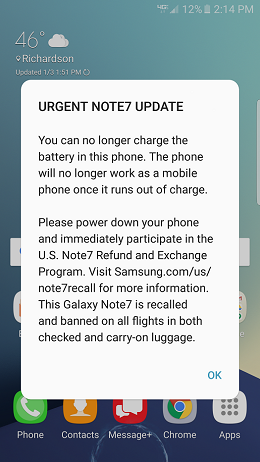 Starting today, remaining Galaxy Note 7 devices from Verizon will see an update that kills the phone’s ability to charge. We knew this update was coming today, so if you are still holding on to a Note 7, your time is now officially limited. The update will arrive as software N930VVRS3APL2. Once updated, the phone will no longer be able to charge, but will still turn on when plugged into a wall charger. Once you unplug it, though, it’ll die again. Time to pick-up a new phone, homies.